A Delta 2 rocket launches with the Aquarius/SAC-D spacecraft payload from Space Launch Complex 2 at Vandenberg Air Force Base, Calif. on June 10, 2011. The joint U.S./Argentinian Aquarius/SAC-D mission will map the salinity at the ocean surface to improve understanding of two major components of Earth's climate system: the water cycle and ocean circulation. SAN FRANCISCO — NASA’s Earth Science Division will be able to launch two missions per year under its current budget outlook if the agency can find reliable, affordable rides into orbit for those spacecraft, said Michael Freilich, the division’s director. But Freilich acknowledged that is a big if, explaining that rising launch costs make "one or two" missions a year more likely. In light of recent launch failures, NASA Earth science officials are "carving money out of our budget for more expensive but hopefully more reliable launch vehicles," Freilich said Dec. 6 during a meeting of the American Geophysical Union here. An Orbital Sciences Corporation Taurus XL rocket carrying NASA’s Glory spacecraft launched from Space Launch Complex 576-E here at 2:09 a.m. (PST) March 4, 2011. 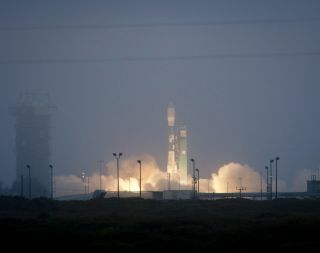 Two Earth science missions, NASA’s Orbiting Carbon Observatory and the joint U.S.-Argentine Glory climate monitoring satellite, were destroyed as a result of launch failures in February 2009 and March 2011, respectively. In light of those losses, NASA’s Launch Services Program is "working hard with our industry partners to find suitable launch vehicles," Freilich said. "The nation has two competing worthy objectives," he explained. Both President Barack Obama’s administration and Congress have shown support for a vigorous, space-based Earth observation program. At the same time, the National Space Policy unveiled in June 2010 calls for support of a vigorous, domestic expendable launch vehicle program. NASA’s Earth Science Division "is at the nexus of those competing desires" because program managers may have to pay more for U.S. launch vehicles than for foreign rockets. As a result, the Earth Science Division may have less money for its programs. There is a "conflict in national policies," Freilich said. That conflict also is making it difficult for NASA to take advantage of opportunities to send Earth science instruments into space as hosted payloads on commercial communications satellites, said Berrien Moore, co-chairman of the National Research Council panel that created the first Earth science decadal survey, a 10-year plan for space-based Earth observation released in 2009. Several researchers including Moore hoped to propose instruments designed to fly as hosted payloads on commercial geostationary satellites as part of NASA’s Earth Venture-2 competition for science-driven missions that can be launched within five years and completed for $150 million or less. When the NASA Earth Venture-2 Announcement of Opportunity released in September included a requirement for teams to vouch that their missions would fly on U.S. launch vehicles, the scientists had to revise proposals. "When you require a private sector company to make a commitment today to use an American launch vehicle in 2017, that’s a nonstarter," said Moore, dean of the College of Atmospheric and Geographic Sciences at the University of Oklahoma. "It seems like on some ventures, we ought to get a little flexibility." Freilich said NASA officials tried "very, very hard" to provide that flexibility in the Earth Venture-2 program but were not successful because the requirement to send U.S. government satellites into orbit on domestic launch vehicles is reflected in national policy and U.S. law. Nevertheless, NASA officials will continue looking for ways to send Earth observation instruments into geostationary orbit as hosted payloads on commercial satellites. To do that, they will have to clear two hurdles: the National Space Policy and the desire of scientists to obtain data in low-Earth orbit. "For a lot of what we do, [geostationary orbit] is not the optimal location," Freilich said. Still, geostationary orbit is likely to provide an affordable way to fly instruments capable of capturing some of the data scientists seek. With current budget constraints, that may be better than no mission at all, he added. Overall, the Earth science program plan Freilich outlined was more circumspect than the program he described in December 2010. At that time, NASA leaders were optimistic that Earth science budgets would rise dramatically because the president’s five-year spending plan included significant increases. Congress, however, opted for more modest funding hikes when the 2011 budget finally passed in May. Freilich referred to NASA’s 2011 budget plan — which envisioned steady annual increases and included more than $1.9 billion for Earth science in 2012 — as "somewhat hallucinatory." NASA’s actual 2012 budget, which became law in November, includes $1.77 billion for Earth science, or about $30 million more than the division got for 2011. Freilich cautioned that his division would have to guard against excessive optimism in future mission plans. "We thought we had lower-cost launch vehicles than actually presently exist, and we thought some launch vehicles would be more reliable than they turned out to be," he said. "We are looking very carefully at what we can execute. Have to be careful not to be irrationally exuberant." The current program plan includes launch of the Landsat Data Continuity Mission in January 2013. That mission, originally scheduled to launch in December 2012, slipped 40 days to accommodate launches of a national security satellite and a Tracking and Data Relay Satellite, Freilich said. The Global Precipitation Measurement satellite, a mission NASA is developing with the Japan Aerospace Exploration Agency to monitor snow and rainfall, is scheduled for launch in February 2014. That mission, originally set to launch in 2013, is being delayed due to "development issues on both sides," Freilich said. Launch vehicle concerns are likely to delay flight of the Orbiting Carbon Observatory (OCO)-2 and the Soil Moisture Active-Passive (SMAP) mission. For each program, launch typically is scheduled to occur 24 months after a rocket is selected. "Right now that [launch vehicle selection] is on hold," Freilich said. After two consecutive failures of Orbital Sciences Corp.’s Taurus XL rocket, the Earth Science Division has revised its standards on the amount of risk it is willing to accept in launch programs, he added. OCO-2 was scheduled to launch on a Taurus XL in February 2013, but NASA rescinded Orbital’s launch contract for the mission earlier this year. SMAP, which had been slated to fly in late 2014, is a candidate for an Atlas 5 or Falcon 9 launch. However, the NASA Office of Inspector General urged the agency to consider launching the spacecraft on an Orbital Sciences-provided Minotaur rocket, a lower-cost launcher that uses excess Peacekeeper missile stages. The instruments onboard the two missions the Earth Science Division launched in 2011, the U.S.-Argentine Aquarius SAC-D sea surface salinity project and the National Polar Orbiting Environmental Satellite System Preparatory Project (NPP), are performing well, Freilich said. Aquarius, which launched in June, already is providing weekly, high-resolution salinity maps. In late 2014, NASA plans to send the Stratospheric Aerosol and Gas Experiment 3, a mission that has been stored for nearly a decade at NASA’s Langley Research Center in Hampton, Va., to the International Space Station. The Air Force will contract for the SAGE-3 launch. NASA also is working with the Air Force to identify a rideshare opportunity in late 2015 for the Ice, Cloud, and land Elevation Satellite-2. "We hope it goes with one of the Defense Meteorological Support Program satellites," Freilich said.